The endogenous production of nitric oxide (NO) regulates a wide variety of biological functions. It is becoming increasingly clear that disruption or dysregulation of NO based signaling is involved in many human diseases. Methods to quantify relevant NO metabolites may provide novel diagnostic or prognostic biomarkers for human disease. Jiang, H., Parthasarathy, D., Torregrossa, A. C., Mian, A., Bryan, N. S. Analytical Techniques for Assaying Nitric Oxide Bioactivity. J. Vis. Exp. (64), e3722, doi:10.3791/3722 (2012). Nitric oxide (NO) is a diatomic free radical that is extremely short lived in biological systems (less than 1 second in circulating blood)1. NO may be considered one of the most important signaling molecules produced in our body, regulating essential functions including but not limited to regulation of blood pressure, immune response and neural communication. Therefore its accurate detection and quantification in biological matrices is critical to understanding the role of NO in health and disease. With such a short physiological half life of NO, alternative strategies for the detection of reaction products of NO biochemistry have been developed. The quantification of relevant NO metabolites in multiple biological compartments provides valuable information with regards to in vivo NO production, bioavailability and metabolism. Simply sampling a single compartment such as blood or plasma may not always provide an accurate assessment of whole body NO status, particularly in tissues. The ability to compare blood with select tissues in experimental animals will help bridge the gap between basic science and clinical medicine as far as diagnostic and prognostic utility of NO biomarkers in health and disease. Therefore, extrapolation of plasma or blood NO status to specific tissues of interest is no longer a valid approach. As a result, methods continue to be developed and validated which allow the detection and quantification of NO and NO-related products/metabolites in multiple compartments of experimental animals in vivo. The established paradigm of NO biochemistry from production by NO synthases to activation of soluble guanylyl cyclase (sGC) to eventual oxidation to nitrite (NO2-) and nitrate (NO3-) may only represent part of NO's effects in vivo. The interaction of NO and NO-derived metabolites with protein thiols, secondary amines, and metals to form S-nitrosothiols (RSNOs), N-nitrosamines (RNNOs), and nitrosyl-heme respectively represent cGMP-independent effects of NO and are likely just as important physiologically as activation of sGC by NO. A true understanding of NO in physiology is derived from in vivo experiments sampling multiple compartments simultaneously. Nitric oxide (NO) methodology is a complex and often confusing science and the focus of many debates and discussion concerning NO biochemistry. The elucidation of new mechanisms and signaling pathways involving NO hinges on our ability to specifically, selectively and sensitively detect and quantify NO and all relevant NO products and metabolites in complex biological matrices. Here, we present a method for the rapid and sensitive analysis of nitrite and nitrate by HPLC as well as detection of free NO in biological samples using in vitro ozone based chemiluminescence with chemical derivitazation to determine molecular source of NO as well as ex vivo with organ bath myography. Collect venous blood from humans or from experimental animals in NEM/EDTA containing tubes. Immediately spin down blood in a benchtop centrifuge at 14,300 rcf (relative centrifugal force) for 7 minutes to prepare plasma and red blood cell pellet. Prepare plasma samples for high performance liquid chromatography (HPLC) and chemiluminescence detection (CLD) analysis. HPLC: Add 1:1 volume of cold methanol to plasma, vortex and centrifuge at 13,200 rpm for 10 minutes to precipitate plasma proteins. Collect supernatant for HPLC analysis. CLD: aliquot a sample and preincubate with sulfanilamide and mercuric chloride to specifically assay nitrosothiols. Prepare red cell pellet for HPLC and CLD analysis. HPLC: Add 1:4 red cell pellet to a hypotonic lysis solution containing 10 mM NEM, 2.5 mM EDTA and 10 mM ferricyanide. Vortex thoroughly and then add 1:1 methanol, vortex and centrifuge at 13,200 rpm for 10 minutes to precipitate protein. Collect supernatant for HPLC analysis. CLD. Add 1:4 red cell pellet to a hypotonic lysis solution containing 10 mM EDTA, 2.5 mM EDTA and 10 mM Ferricyanide. Aliquot samples to tubes containing sulfanilamide and mercuric chloride for specific detection of nitrosothiols. To determine tissue levels of NO metabolites, it is first necessary to harvest blood free tissue for sample preparation as described above. A full blood exchange will take place by infusing physiological buffer through the apex of the left ventricle. Once all blood is removed, tissues of interest can then be harvested. Homogenize tissue samples and prepare samples as described above for HPLC and CLD analysis. Mice will be anesthetized with diethyl ether until no longer responsive to toe pinch, and undergo cervical dislocation prior to surgery. A thoracotomy is performed to expose thoracic and abdominal aorta. A 25 gauge syringe is inserted into the apex of left ventricle and perfused free of blood with oxygenated Krebs Henseleit buffer. The right atrium is cut to provide an exit for blood. Abdominal aorta will be removed and cleaned of adventitia. Rings will be cut into 2 mm long segments and mounted on a four-channel tissue organ bath (DMT 720MO, AD Instruments) bathed in a physiological buffer solution. Vessel rings are maintained in 10-ml organ baths with oxygenated Krebs buffer (95% O2 and 5% CO2) at 37 °C. One gram pretension is placed on each aortic ring (appropriate starting tension for optimal vasomotor function as determined in previous experiments). An eight-channel octal bridge (Powerlab) and data-acquisition software (Chart version 5.2.2) are used to record all force measurements. Rings are allowed to equilibrate for 80 minutes with the buffer in each organ bath changed every 20 min. After equilibration for 80 min, 1 μM phenylephrine is added to each ring for submaximal contraction. After stabilization, endothelial agonist such as acetylcholine will be added to determine NO production and degree of vessel relaxation. After the dose response to acetylcholine, baths will be rinsed and recontracted and then treated with an exogenous source of nitric oxide, sodium nitroprusside to determine responsiveness of smooth muscle and to get a value for 100% relaxation. NO scavengers can be added to bath to clearly illustrate release of NO and inhibition of vessel relaxation. Use of the ENO-20 dedicated HPLC provides an easy to use high throughput method for specific and sensitive detection of nitrite and nitrate in biological matrices. 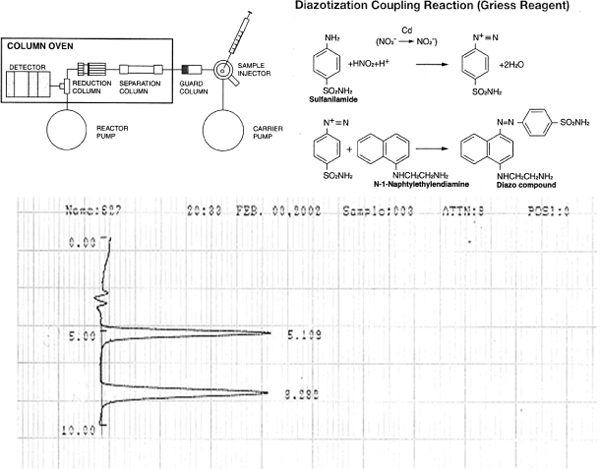 The principle of detection and an original chromatogram is shown in Figure 1. This method can be used for any biological sample for determining nitrite and nitrate. CLD based detection of NO metabolites requires a chemical derivitization step to determine the molecular source of the NO. 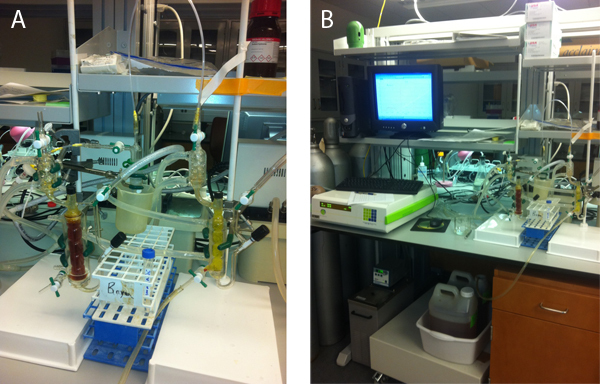 The experimental setup for simultaneous oxidative denitrosation and reductive denitrosation for the chemiluminescence detector is shown in Figure 2. The reaction vessel on the right is filled with 800mM ferricyanide in PBS pH 7.4 and the reaction vessel on the left is filled with potassium iodide/iodine mixture in acetic acid for reduction denitrosation (Figure 2A). The entire setup is shown in Figure 2B. Figure 3 illustrates group specific denitrosation assays that can detect and quantify nitrite, nitrosothiols, nitrosamines as well as nitrosyl heme products. This method has been previously described and validated4,5. These important biochemical analyses can easily be correlated with functional studies on isolated aortic rings to determine endothelial NO production in experimental animals. This classical pharmacological experiment can easily and accurately assess endothelial NO function and production. Measuring vessel reactivity to endothelial agonists such as acetylcholine can directly determine endothelial NO production which can then be correlated with biochemical biomarkers detected in blood and tissue of the experimental animals. A typical representation of a dose response to acetylcholine is shown in Figure 4. 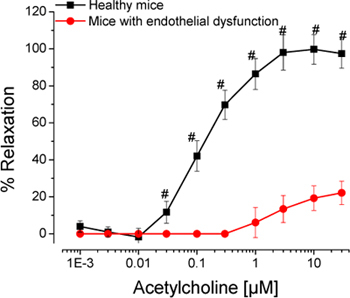 Healthy control mice with normal endothelial function respond to acetylcholine by relaxing. Mice with endothelial dysfunction (hypercholesterolemic mice) show reduced relaxation due to reduced NO production to the same stimulus. Figure 1. Principle of detection of nitrite and nitrate by ENO-20 and sample chromatogram. (Top) Schematic of ENO-20 method of detection for nitrite and nitrate. (bottom) Standard chromotogram of 10 pmol nitrite and nitrate injected into ENO-20 (100 μl of 100 nM solution of nitrite and nitrate). Sensitivity of 1 nM for each anion with 100 μl injection volume. No interference with protein or colored species. Figure 2. CLD experimental setup using both oxidative denitrosation by ferricyanide and reductive denitrosation using iodide/iodine assay with gas phase detection of purged nitric oxide gas. Figure 3. (Panel A) Chemiluminescence detection of nitrite, RSNO, RNNO in reductive denitrosation assay by sample preincubation with group specific chemical reagents. Subtraction of peak areas allow detection of nitrite and RSNOs. (Panel B) Chemiluminescent detection of nitrosyl heme species using oxidative denitrosation solution of ferricyanide. This method is specific for NO-heme products with no cross reactivity with RSNOs (GSNO or SNO-albumin), or RNNO (NO-pyrrolidine and N-nitroso-albumin). Figure 4. Ex vivo organ bath on isolated aortic rings provides a direct measure of endothelial NO production that can then be correlated with biochemical biomarkers detected by HPLC and CLD. This figure illustrates reduced relaxation in mice with endothelial dysfunction due to decreased NO production. The methods described here for the quantification of relevant NO metabolites in multiple biological compartments will allow for fingerprinting of NO biology in health and disease that can be correlated with functional measurements of NO by the endothelium. These methods require simple sample preparation with potential for adapting for high throughput. The relative quantity of these molecules can help understand the production of NO and its metabolic fate in a number of experimental models of disease and even serial samples from human patients. There are many pitfalls in detecting NO based biomarkers and many analytical methods artificially produce some of these products during sample preparation. Careful accounting of nitrite in biological samples is critical due to its reactivity with cysteine thiols6 and artifactual formation of nitrosothiols7. CLD based methodologies for specific detection of nitrite under anaerobic conditions lead to inconsistent results due to the activity of specific nitrite reductase enzymes in different biological compartments8. All of the methods described here are well documented and validated and take into consideration steps to eliminate or reduce artifacts9. We will describe critical steps necessary to prevent artifacts. This multi-compartment screening of NO metabolites will help in identifying relevant biomarkers that may have diagnostic or prognostic utility in humans and will then allow for the development of standardized methods which can be used in the clinic or for standard laboratory analysis. The recent recognition of a human nitrogen cycle whereby nitrate and nitrite are reduced to NO by an enterosalivary circulation of nitrate10,11 now opens up the potential for using saliva as a potential biomarker for NO status in certain diseases. To date NO status is not part of the standard blood chemistry used routinely for diagnostic purposes in patients. This is shocking given the critical nature of NO many disease processes. Ultimately, determining levels of these NO related biomarkers by easy to use and perhaps rapid bed side point-of-care assays after adequate validation will be a real testament to their role in molecular medicine. It is prudent at this juncture for concentrated and combined efforts in the field to validate and develop a standard and accurate assay for determining NO status in animal models for validation in humans. The methods described in this protocol will allow others to rapidly adopt a consensus method for such measurements. The authors would like to thank Hong Jiang, Ph.D. and Deepa Parathasarthy, MPH, BDS for the technical assistance. Kelm, M. Nitric oxide metabolism and breakdown. Biochimica et Biophysica Acta. 1411, 273-289 (1999). Furchgott, R. F., Zawadzki, J. V. The obligatory role of endothelial cells in the relaxation of arterial smooth muscle by acetycholine. Nature. 288, 373-376 (1980). Ignarro, L. J. Endothelium-derived relaxing factor produced and released from artery and vein is nitric oxide. Proc. Natl. Acad Sci. U.S.A. 84, 9265-9269 (1987). Feelisch, M. Concomitant S-, N-, and heme-nitrosylation in biological tissues and fluids: implications for the fate of NO in vivo. FASEB J. 16, 1775-1785 (2002). Wang, X. Measurement of nitric oxide levels in the red cell: validation of tri-iodide-based chemiluminescence with acid-sulfanilamide pretreatment. J. Biol. Chem. 281, 26994-27002 (2006). Angelo, M., Singel, D. J., Stamler, J. S. An S-nitrosothiol (SNO) synthase function of hemoglobin that utilizes nitrite as a substrate. Proc. Natl. Acad. Sci. U.S.A. 103, 8366-8371 (2006). Bryan, N. S. Bound NO in human red blood cells: fact or artifact. Nitric Oxide. 10, 221-228 (2004). Feelisch, M. Tissue Processing of Nitrite in Hypoxia: An Intricate Interplay of Nitric Oxide-Generating and -Scavenging Systems. J. Biol. Chem. 283, 33927-33934 (2008). Bryan, N. S., Grisham, M. B. Methods to detect nitric oxide and its metabolites in biological samples. Free Radic. Biol. Med. 43, 645-657 (2007). Lundberg, J. O., Weitzberg, E. NO generation from inorganic nitrate and nitrite: Role in physiology, nutrition and therapeutics. Arch. Pharm. Res. 32, 1119-1126 (2009). Lundberg, J. O., Weitzberg, E., Gladwin, M. T. The nitrate-nitrite-nitric oxide pathway in physiology and therapeutics. Nat. Rev. Drug. Discov. 7, 156-157 (2008).